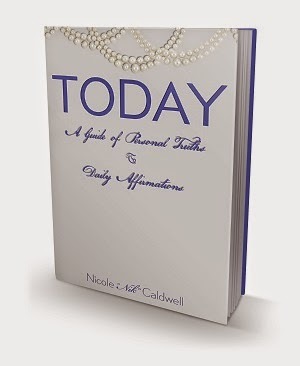 Today we are interviewing Nicole Caldwell, author of the inspirational book Today: A Guide of Personal Truths and Daily Affirmations. I'm a make up artist, stylist, cosmetics entrepreneur in the beauty, fashion and entertainment industries and a motivational speaker. I'm a new author. I also teach career awareness, workplace readiness, as well as image and self-assessment in juvenile detention centers, colleges, and ministries. I'm the founder of Just Glam Cosmetics, Swank accessories and a nonprofit; The Glam Guild. The purpose of TODAY is to give positive reinforcement to daily living, coupled with journaling to help chart progress over time. I want to help others live the life they envision for themselves. I believe anyone who wants to be better will appreciate this book. It's self reflective in nature. It grabs the reader and turns them into a writer instantly because they have to journal through the affirmations, sometimes writing their own. 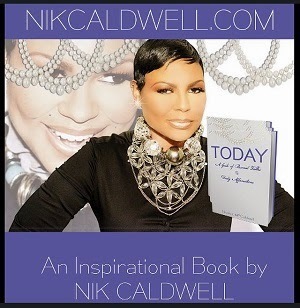 This book helps you to see self and to reaffirm your positive traits while encouraging change for the not so positive. What inspired you to write a book about affirmations? I've been journaling since I was a little girl. Writing affirmations was a part of my daily routine. I would write out what I saw for my future, no matter how far fetched it seemed at the time, I didn't stop until I saw those things come to pass. Even today, I say it before I see it! For those who aren’t familiar with affirmations, can you explain the basics of them? Affirmations are quite simplistic in nature; you say it until you begin to see it. It’s like a precursor to faith. The miracle comes into play when you actually start believing what you say, because you then start acting on it and you’ll start to see it lining up. What made you decide to couple journaling exercises with the process of saying affirmations? I believe lives will continue to be changed and transformed through self reflective discovery and through reshaping our own ideals based on life's experiences. When we take the time to journal and reflect, we have then shown discipline and consistency, which are necessary components to change. For every negative thought, you have to counter with 7 positives to cancel the negative. By affirming yourself as a way of life, you leave little room for negative commentary in your space. Not only for yourself but from others also. I've started to write more. I have two other books that I'll be publishing somewhere in the near future. This book is life changing. I've lived through each affirmation in Today at a point in my life, so I know first hand what it takes to live it outloud.